I am a bit late posting my WOYWW today. AND - you are only getting a sneaky peek at what I have been making this week!! Annie and I went on a bag making workshop yesterday. We had a fab day - lots of laughter and crafting with two lovely friends. I ran out of time and fabric so my bag isn't quite finished. I am really pleased with it so far, so I will make sure I do the last little bit later today, ready to show and tell later in the week. A pretty little lace flower made using an idea I found on Pinterest. Two little dressing up outfits for the twins. Sorry for the photo quality - I used my phone and I think I must have sneezed at the same time!! 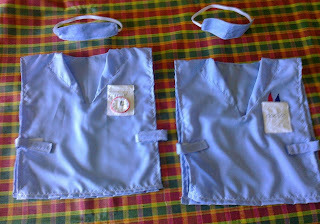 Doctor and Nurse outfits - of course they both wanted to wear the one with the velcro-ed on watch on the pocket!! So, I guess I need to make another little watch for the Doctor! Have a great week - see you later when I check out your desk. Ohhh they are such gorgeous little nurse outfits. Of course they would both want to have the watch!! Looking forward to more peeks of your bag. Didn't we have a lovely day yesterday and I know we are both thrilled to bit with the results. And the bag is looking rather fab too..shall look forwards to the big reveal! oh that bag looks so pretty! 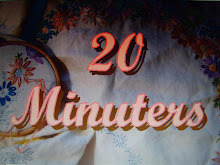 you are a talented seamstress! Those dress up outfits are SO cute, what a great thing, to make them smocks, so much easier for off and on, not to mention the making! PRETTY colors on the new bag, and a nice bit of needle felting peeking out there??? Cute outfits for your twins! Happy WOYWW! Aha, the watches win! How cute they must be playing at nurses and doctors! I love the big eyelets on your bag, I want to see and hear all about it. You are so clever Twigs - all these things are lovely. Can't wait to see that finished bag. thank goodness you have a follow button, if that bag has dowel as handles I really need to know 'how to' so look forward to that post. The photo's were fine, could tell what they were ok.
Jo, I love the blue flower, so delicate, is it crocheted or knitted? Dressing up outfits are always a winner with kids aren't they. Going to be two happy little souls there. love your bag making, super fabric. The nurse and doctor outfits look so cute and I can imagine the play scenario they will make up. Always something lovely going on there. Those outfits are the cutest things! 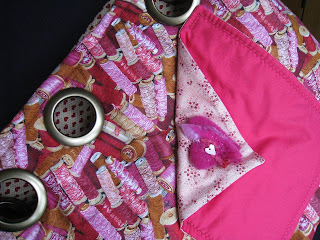 And I love the thread spool fabric, so much fun. What fabulous outfits you have made for the twins. And how pretty is that flower. Now what intrigues me is the fabric for the bag - doe it have spools of thread on it? Am busting to see the finished article as it loos to have some cool turn down on it. Thanks for the note about the pearl - so annoying. Fabulous little dressing up outfits Jo - I did laugh about the twins scrapping over the watch :) I expect you'll sort that one out soon - such a clever idea too. 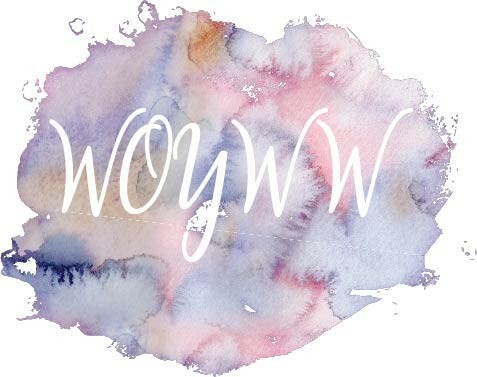 Ok, so I'm really late commenting on the WOYWW blogs, but better late than never as the saying goes! What a bonus by being late - those little dollies all finished. They are so cute. You are very clever, and I love all that you produce. Gosh, just realised, it's half way to the next WOYWW - time flies.